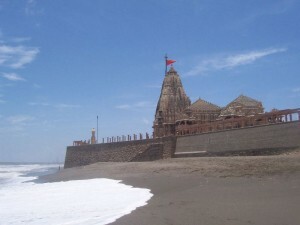 The shore temple of somnath is one of the 12 Jyotirlingas of Lord Shiva. 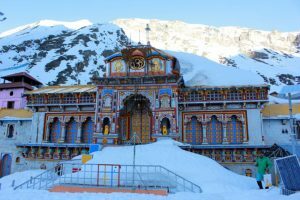 Located in Veraval, it offers a holy pilgrimage, beach holiday and a number of places of historic importance. 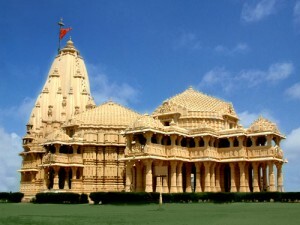 Sardar Patel commissioned the present incarnation of the temple in the 1950s. The temple has imposing architecture and a beautiful sight facing the blue expanse of the Arabian Sea. A short distance from Somnath temple is Bakhla Tirth, where Lord Krishna was said to have been struck by the stray of a Bhil Tribal. Rail: There are trains from Ahmedabad to Veraval. Road: Somnath is 405 km from Ahmedabad. Private Luxury buses and Gujarat State Transport Service buses are available from Ahmedabad and other cities of Gujarat. This entry was posted in Gujarat, Somenath and tagged indian temple, shiva temple, somenath temple, Temple. Bookmark the permalink.